Saltbox shed plans feature the architectural style famous during the Colonial times in America. It’s called as such, because it resembles the structure of the container used in the olden times to store salt. The distinctive characteristics of this shed are its flat front and long, pitched roof that drops down to the rear of the house. The saltbox style started in England when two-storey cottages weren’t enough for their owners, who then began building additional rooms at the back of the house. In the 1600s, the English settlers in America brought this home design to New England where it gained popularity. Some house builders then started constructing new homes using architectural plans with the saltbox design. Later on, saltbox shed plans arose, too. If you’d like to build a shed that’s styled like the classic saltbox, you should start with plywood for the floor of your shed. If you will be storing heavy items like machines and farm equipment in your shed, though, you may have to opt for concrete, as it’s obviously a stronger choice over plywood. These New England Colonial structures were usually made of frame or clapboard siding. Saltbox shed plans today usually specify vinyl siding, since vinyl is the least expensive, as well as the most durable siding material you can find today. If you’d like material that’s easy to install and maintain, vinyl would be a good choice for your siding. There are some vinyl siding materials today that imitate the appearance of clapboard very well. However, if you really prefer the traditional wood siding, you can have oak or cedar. Make sure that your wood materials is stained or painted. You also need to be prepared for the costs of wood siding, which is doubly expensive to install and maintain than vinyl. 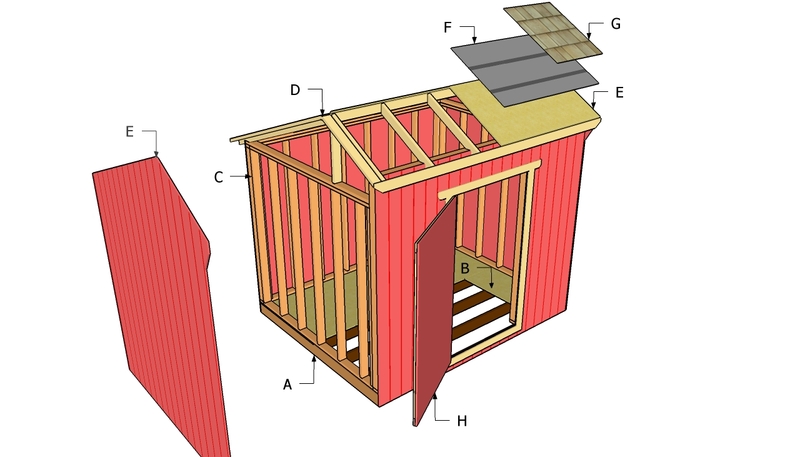 As mentioned earlier, a saltbox structure has to have a flat front and an asymmetrical roof, so saltbox shed plans should clearly specify them. Shingles usually make up the uneven roof, but the modern sheds generally have a tin roof reinforced with vinyl to make it last longer. Vinyl roofing is used, because it promises protection from roof leaks and, of course, budget savings. For a traditional saltbox roof, use dark-colored shingles. Last but not the least, make sure you get your details right. Have a transom at the front door. Make your windows simply framed and multi-paned. Finish it off by painting the walls brick red and the door and window frames white. The result would be a shed that resembles the unique Colonial architecture of New England.